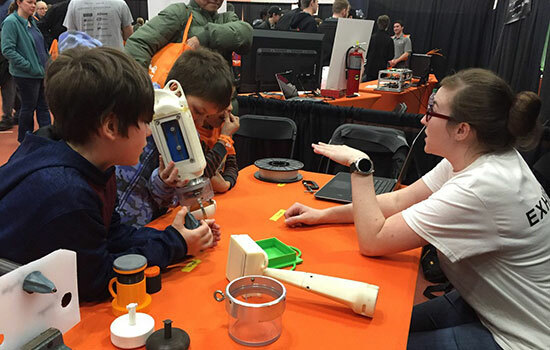 Cayla Denning talked to visitors at the Imagine RIT festival about NEBULA, a module leak repair system prototype device she and her teammates developed for NASA's Micro-g NExT design challenge. The team heads to Johnson Space Center in June to test the device. The simplicity of a pen’s clicking mechanism inspired five RIT students to build a tool for NASA that could someday be used for space exploration. Students from RIT’s College of Applied Science and Technology qualified for Phase II, the testing round of NASA’s Micro-g NExT design challenge, a national competition to build equipment prototypes. They will travel to Johnson Space Center in Houston June 4-7 to work with astronauts in NASA’s Neutral Buoyancy Lab to see if NEBULA, the module leak repair system they built, can withstand conditions that might be experienced in space. This is the third year an RIT student-team advanced to the next stage of development. Using the concept of a pen’s spring-action mechanism, the team developed NEBULA, a tool to repair punctures in the International Space Station caused by debris floating in space. Consisting of three components—an exterior sealing plate, “umbrella” and push rod—the device is compact, re-usable and easy for astronauts in space suits to manage. All parts, except for small attachments, were designed and built by the team using 3D-print technologies, said Christopher Callejo, co-lead on the project. “We all learned how complex the design that goes into a pen can be, and scaling it to a different size to make it fit is a lot more difficult than you can imagine, but it was something we learned very quickly to do,” said Callejo, a fifth-year mechanical engineering technology student from W. Babylon, N.Y. The team began work in September, meeting throughout the academic year outside of regular classes to build and test a prototype. The leak repair system was one of four challenges the students could choose from that also included a sharp edge detection and removal/covering, zip tie cutters and an under ice sampling device. NASA engineers are available to all teams in the early stages of designing to work with students. They meet for a week over the summer to test prototypes in the Neutral Buoyancy Lab, a 40-foot deep pool astronauts use to train for spacewalks. The exterior plate of their device acts as a surface sealing mechanism. Contained inside the plate is a hollow cylinder with a snap ring, a type of fastener, to affix the umbrella on the surface. The umbrella holds the NEBULA in place so that the push rod can seal the hole. Once completed, the rod can be detached from the assembly and re-used with another umbrella and assembly plate. That experience was shared with the general public. The team first demonstrated the design at the recent Imagine RIT: Innovation and Creativity Festival. During outreach activities with teenagers from a local YMCA, they talked about the project and encouraged the teens to consider careers in engineering and the importance of team collaborations. In the four years of the design challenge, projects done by university students from across the country are archived, some developed further, and others combined to provide solutions for NASA missions. Team members, all mechanical engineering technology majors, are Callejo; Denning; Kory Schimmelfennig, from Staatsburg, N.Y.; Kathleen Hagelberger, Darien Center, N.Y.; and Isaac Deppen, Seattle, Wash.